La Marine Française (French Navy) is still called “La Royale” to this day (“Royal” (navy)) according to its pre-revolutionary traditions. Of considerable size by 1918, she was drastically reduced after Washington’s treat limitation in 1922, shaping in the end a smaller, but homogeneous fleet of excellent overall quality, but nevertheless with some inherent limitations that would have hampered its capabilities in WW2 if her fate has to serve with the allies for the whole duration of the conflict. Instead she suffered a cruel fate, most of its officers remaining faithful to Vichy France. French ships were found either sunk, fighting the allies, or scuttled. A fraction however escaped this fate for various reasons, but in the end remaining ships still present in the Empire swapped side due to Admiral Darlan‘s own shifting of allegiance and joined the allies, participating in many operations until the end of the war under the Free French flag. 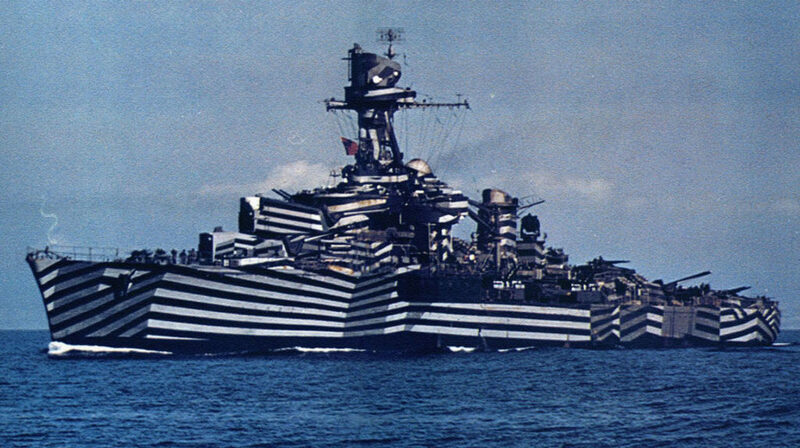 Gloire, Light cruiser of the La Galissonière class, and her famous 1944 dazzle camouflage. Six ships considered particularly successful, derived from Emile Bertin. Their square stern, concentrated armour, triple turrets, and large aircraft facilities were noted. In 1918, the French Navy emerged in a sorry state. Still massive on paper, she has fallen to a lower rank due to a lack of manpower and complete freeze in naval construction but a handful of patrol boats and sub-chasers. Sailors went in the trenches, and often navy officers and future prominent admirals like Muselier and Darlan would learn their artillery trade on the Western Front. The Mediterranean was the main front for “La Royale”, loosing ships to U-boats and mines, especially in the Dardanelles. Shipyards had to be reequipped after 1918, resume construction of the ships started before the war (like the interesting Bearn and Lion class battleships) but there were other priorities ahead, and the funds were not allocated yet. In 1922, the naval race ongoing at the end of 1918 was put to a complete halt. Europe needed reconstruction, and in general there was a will of de-militarizing society, also shown by the creation of the League of Nations, pet project of President Wilson. As a result, France being a signatory nation, was found relegated on the same rank as the Italian Navy, at 175,000 tons (The US Navy and Royal Navy were allocated 525 000 tonnes, Japan 315 000 tonnes). This was criticized, as woefully insufficient to deal with the Empire. However, this limit paradoxically led to two consequences: The French navy was able to not disperse itself, concentrating on the most important ships and building a coherent and innovative navy, of far better shape than in 1914. The other consequence was to create a de facto rivalry with Italy. Indeed, not being capable anymore to safeguard the channel or assure a sizeable permanence in the Atlantic, the French navy concentrated in Toulon and the Mediterranean, which was also the way to its colonial empire, in Africa, Syria, and through the suez canal, to Indochina. This led to a construction programme which was closely matched, almost on a ship-to-ship basis, by the Italian navy. This does however prevented Germany to also built her ships to match the French Navy. By the way, both Italy and France developed locally a tradition of “tin clad cruisers”, lightly built, but very fast. This was also true for battleships like the Dunkerque, which were little more than glorified battlecruisers. The situation evolved however with the arrival of the Algerie in 1931, perhaps the best 10,000 tons cruiser design of the era, and in 1939 with the Richelieu, a true battleship by any means, but retaining French characteristics like the front-only heavy artillery in quadruple turrets (The British Rodney also favored this radical solution) and the “mack” or funnel-mast. Since there was no limitations for aircraft carriers, France converted its almost finished Bearn battleship into one, the first French aircraft carrier. Two more, this time tailor-designed, of the Joffre class, were added to the programme at the end of the 1930s but suffering delays, they would never be completed. Before ww2, “La Royale” was the fourth world’s largest navy, behind the British, American, and Japanese. Its only rival in the Mediterranean was the Regia Marina (Italian Navy) and its other potential rival, the Kriegsmarine (far behind in terms of tonnage) was dealt by the Royal Navy. Indeed since 1914 the tacit agreement between France and Great Britain was still active, meaning that the French navy in case of conflict, would ensure the bulk of the naval effort in the Mediterranean so the British don’t have to. To protect the interest of Great Britain, the Royal Navy had neverthless a handful of bases: Gibraltar, closing the Mediterranean westwards, and Alexandria Eastwards, gate-guarding the vital Suez Canal. Toulon, Dakar, Mers el Kebir on the French side were operational bases, some like the latter, being completely rebuild, modernized and enhanced. However the defeat of France and surrender completely shatterred these plans in june 1940. The Royal Navy was deprived of any support in the Mediterranean, having to face the might of the Italian Navy, the Luftwaffe and even a fiercely neutral, later hostile French navy. There are two what-if French Navy scenarios to consider. First: What if the French Navy has maintained its naval construction programme from 1912, including the two new classes of battleships and battlecruisers in the Great war. Second, what if the second world war has erupted two years later, in 1941. There were a whole range of new ships in the yards back then that would have been completed, from the new Joffre class aircraft carriers, Gascoigne class battleships, to the St Louis and De Grasse class cruisers. In the first scenario, the 25,000 tons Normandie class and 29,000 tons Lyon class battleships would have replaced without any doubt the early Courbet, by 1918 already obsolete with their 305 mm guns in lozenge arrangement. The Lyon class in particular, would have been game changers in the Mediterranean if completed, and IF modernized the proper way. In fact if they had been rebuilt as the four Italian battleships of the class Duilio and Caesare were, they would have been very hard to match in any naval battle. With perhaps 35,000 tons including ASW bulkheads, 200+ m with a new prow, and no less than 16 x 340 mm guns, they would have largely surpassed their Italian counterparts indeed or constitute a very serious threat against 380 mm armed British Resolution and Queen Elisabeth battleships in Vichy hands. Completely rebuilt and modernized the Italian way in the late 1930s. The second scenario would have seen the constitution of two modern Mediterranean “task forces” centered around modern, fast aircraft carriers capable of operating 40+ aircraft each, where the Italians lacked any of the kind, protected by new battleships of the Gascoigne class that showed a more classical artillery with one quadruple turret at the front and rear, and improved protection. 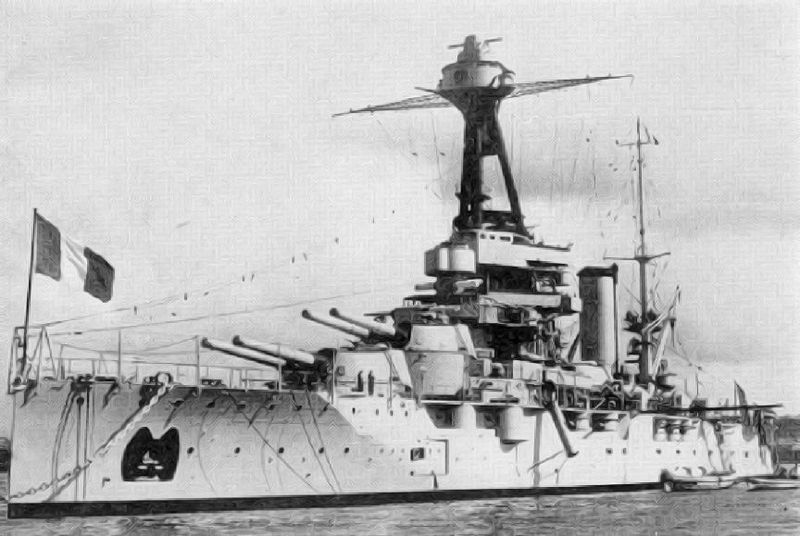 The St Louis heavy cruisers were closely related to the Algérie, with an even improved armoured scheme, and for the first time triple 8 in turrets. They would have been lighter equivalents of the latter US heavy cruisers of the Baltimore class. On the other hand, the new 3900 tonnes Desaix class destroyers would have been improved Mogador, considered as “super destroyers”, cultivating an impressive 42 knots top speed and powerful main armament worthy of “pocket cruisers”. Dunkerque’s own armour internal arrangement. Now let’s uninflate this straight on: The French navy, despite some appareances was not this modern, high quality navy sacrificed by events history often depicts. First-off, the good-looking Dunkerque class were only glorified battlecruisers, with limited armour and constraints in firing range due to the radical approach in artillery. It should be noted also that so close guns would also meant more shells dispersion and a lucky hit could disable half the artillery (individual cannons protections were added on the Richelieu). The Richelieu drew most of the lessons and featured an innovative prow, a “mack” later adopted by cold war warships because of the multiplication of radars arrays. Crucially also, the 5 older battleships featured by “La Royale” were never modernized as they should. French cruisers until the Algerie all featured good speed but totally sacrificed protection. French Destroyer Le Fantasque. With their breakneck speed and powerful armament, the Fantasque and Mogador easily outclassed any other destroyers in the Mediterranean and were a match for Italian light cruisers. But lacking in AA artillery, radars, ASW capabilities or effective air support, there was room for improvement. 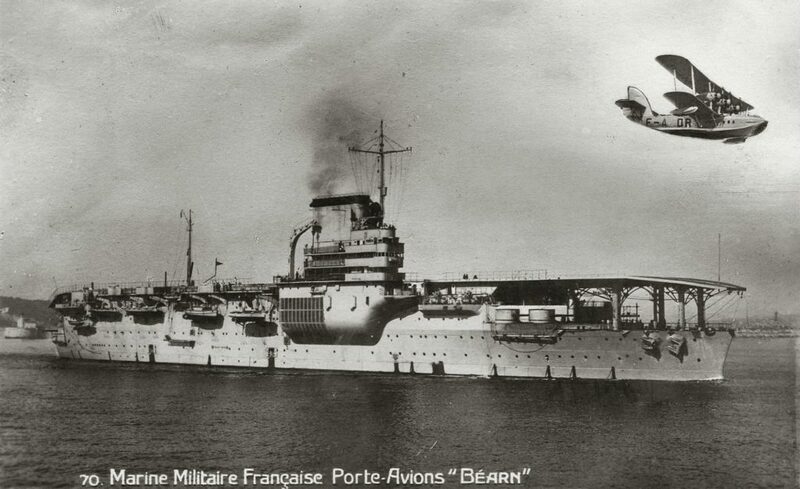 The Béarn was a small aircraft carrier, unfit for more modern monoplanes, and slow. The Cdt Teste was proceeding of an old concept of air reconnaissance that was stuck in ww1 naval tactics and of little use in ww2. More crucially, still in 1940 the French navy completely lacked any radar. The device was known but there was no effort at any rate to try to develop this technology. Fairly it has to be precised however that at that stage only the Royal Navy and Germany ventured into it. Neither the Japanese and Italians adopted it, and the US Navy only experimented it in 1941. ASW was limited, relying on ww1-era light ships. French destroyers had limited ASW grenades, but no dedicated lighter ships, like frigates. Instead, there were a handful of 1930s torpedo boats (with more on order), again, an obsolete proposition. Moreover, AA artillery was poor at best, even by 1940 standards. 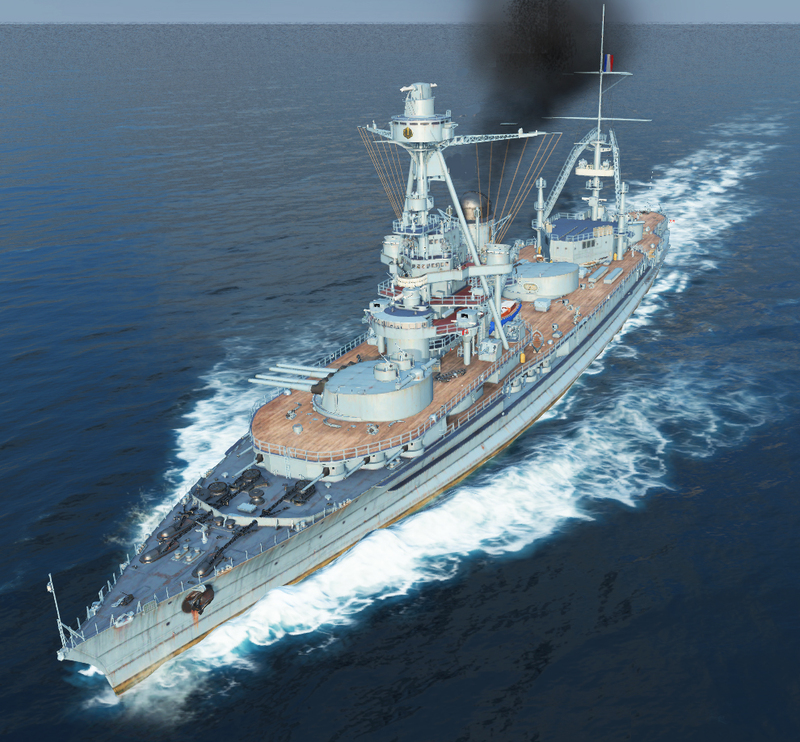 Until its refit in New York NYd with modern American AA defence, Richelieu had ony a handful of short-range 13 mm MGs and a few relatively slow-moving, slow rpm dual-purpose guns. Air defence was clearly the least of concerns for the admiralty, which was still obsessed by the concept of “big gun battles” (still shared by many admiralties worldwide). The oldest ones were those of the Courbet class (1911), originally four ships, but France was lost on a reef in the bay of Quiberon in 1922. The Courbet, Ocean and Paris were modernized in 1926-29 with a tripod supporting new rangefinders. Later some (symbolic) AA was added. 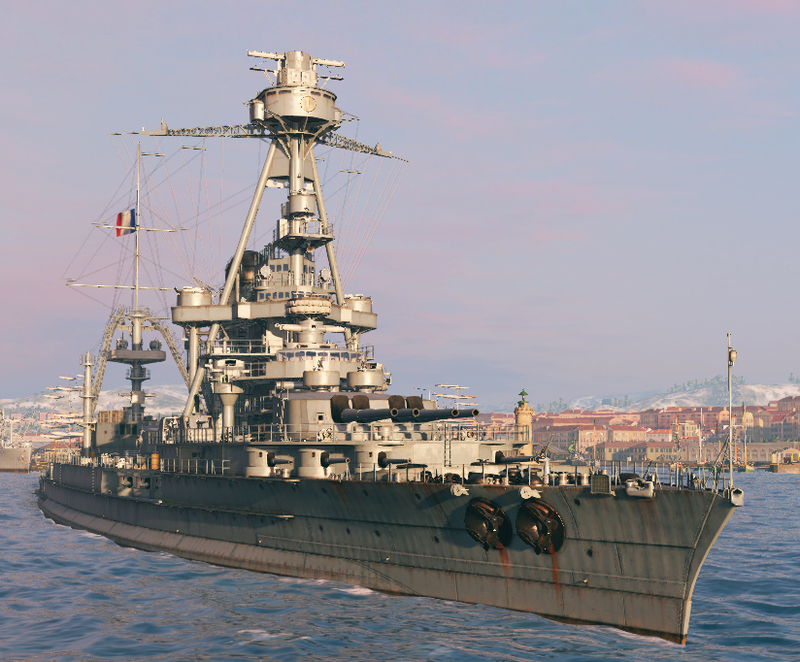 In 1938, the Ocean was renamed Jean Bart and assigned to Brest as a training ship. 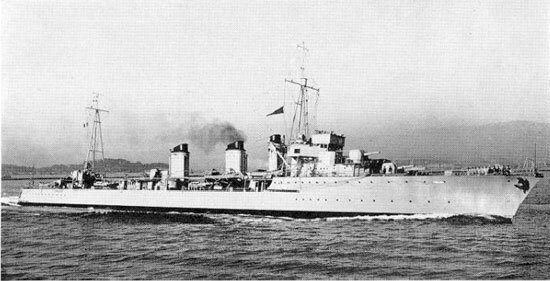 The Courbet and Paris served as training ships in 1939. The most active were the three later ships of the Bretagne (Brittany) class (Bretagne, Provence, Lorraine, 1913). Their modernization was more extensive and intervened in 1921, then in 1932-35. This however never matched the scale of the Italian rebuild. Provence after her second refit in 1936. Under construction, the first “super-dreadnoughts”, or fast battleships which existed as blueprints since the late 1920s, were again possible with the expiry of the Washington moratorium. These were the Richelieu and the Jean Bart, two units of 35,000 tons, begun in 1935 (for the first) and January 1939 (for the second). In fact, the Richelieu had been launched in January 1939, and was almost operational in July 1940. So she must be discounted in this picture. 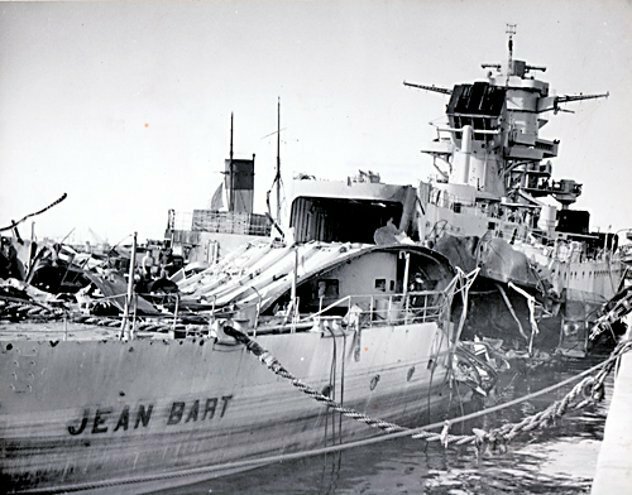 The Jean Bart, for her part, managed to leave the drydocks of Saint-Nazaire and to reach Casablanca, far from being Completed, thanks to Lieutenant Ronarc’h skills and a handful of crewmen, avoiding capture by the Wehrmacht. The other two planned for 1941 and 1942 were the Clémenceau and Gascoigne. The first was launched in 1943 but never completed and her hull destroyed during an allied air raid in 1944. These ships completed the Dunkerque class. Both inaugurated the twin quad-turrets configuration at the front, but their armour scheme was still relatively light and akin battle-cruisers (They replied to the Deutschland pocket battleships, and were answered by the two German Scharnhorst, also trading protection for speed). Dunkirk and Strasbourg were started in 1932-34, entering service in 1937-38, and were responded by the Italians with their Littorio. Their short career was active, especially between September 1939 and June 1940 when they hunted the German Graf Spee, but sadly ended in November 1943 in Toulon. Attempts had been made with the old Foudre during the great war, as well as the Bapaume (a Frigate). But it was not until 1927, after the reconversion and the completion of the Béarn, that the French navy acquired its first aircraft carrier. Former unfinished battleship, she had however some inherited flaws, including a slow speed, but the advantage of a heavy armour and, width to accomodate a large flight deck. Her tailor-made hangar allowed to carry 40 aircrafts, biplanes designed in the early 1930s. Apart the dive bombers of the LN 401 type and imported SB2U Vindicator (that mostly operated from land bases) Béarn’s own air force was obsolete. Her main fighter, the Levasseur PL.5 dated back from 1924. The Béarn was to be followed by the first dedicated French flat-tops, the two Joffre. Programmed in 1938, they were considerably larger and faster, and can operate up to 60 modern aircraft. The first was begun in 1938, but was neither launched nor completed. Also in service was the Commander Teste. She was a “seaplane carrier”, quite capable of operating torpedo bombers and reconnaissance seaplanes for the fleet, including the fast Laté 298 torpedo floatplane. The first were those of the Primauguet class. These three units (Primauguet, Lamotte-Picquet, Latouche-Tréville), launched in 1923-24, were light vessels (main artillery, height 152 mm pieces). These had been first ordered as part of the Lapeyriere plan of 191, later suspended by the war. The first French heavy cruisers were typical of the Washington Treaty models: 10,000 tons, eight 8-in guns. These were the Duquesne class (Duquesne, Tourville, 1925-26), followed by the four Suffren class (Suffren, Colbert, Foch, Dupleix, 1930-32). Algeria, which followed in 1930, was a little different. Last heavy French cruiser, she had a singular silhouette: lower “flush deck” bridge, single mast-chimney, and tower as on the Dunkirk instead of a tripod. Praised by naval analysts around the globe then as the best possible compromise, she was to constitute the prototype of the future “Saint Louis”, approved in March 1940 but never built, all to be given nine guns in three triple turrets. The light cruisers started with the school ship Jeanne d’Arc, third of the name, launched in 1930, and Pluto, a minesweeper launched in 1929, rebuilt, and renamed La Tour d’Auvergne little before the war. 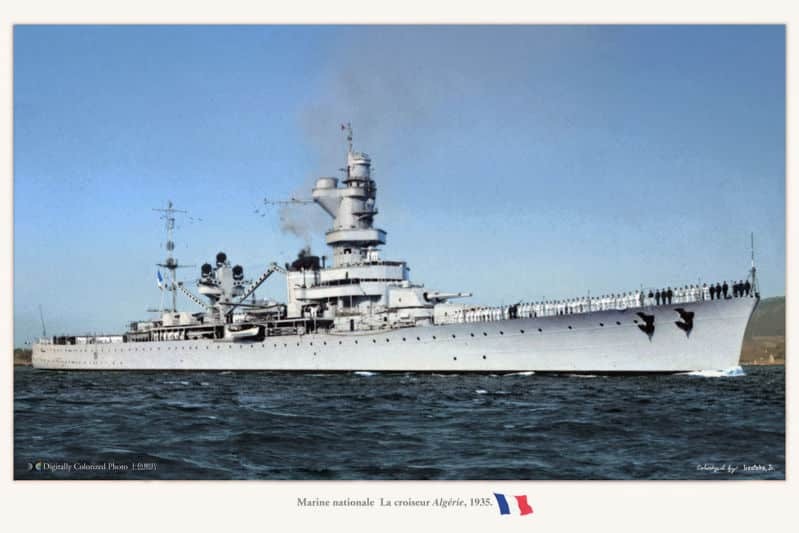 There was also the Emile Bertin (1933), a prototype of light cruiser featuring triple 6-in turrets, followed by the six La Galissonniere (the galissonniere, Jean de Vienne, Marseillaise, Montcalm, Gloire and Georges Leygues, in service in 1935-37), innovating with a new prow, and reworked squared stern. Their successors, the De Grasse, were to have a tower like the St Louis. Approved in 1937 for the first two (De Grasse and Chateaurenault), and 1938 for the other two (Only the Guichen was started), they will be caught in the turmoil of June 1940. De Grasse was lated comleted and rebuilt as a post-war anti-aircraft cruiser, a fitting escord for the Jean Bart, and only enlisted and broken up in 1977. Less known, the navy also operated in the interwar two cruisers obtained in 1918 as war damage. These ex-German cruisers in French service were the Metz (ex.Königsberg) stricken in 1936, and the Strasbourg (ex-Regensburg), also stricken in 1936. In the case of destroyers, France like Great Britain, Japan and the USA developed “standard” types and “squadron leaders”, or heavy destroyers. Lion (6 units in 1924), Gepard (6 others in 1928), Aigle (6 ships in 1930-31), Vauquelin (6 in 1931-32), and finally Le Fantasque (6 buildings, 1934) class, all very recognizable with their three or four funnels. The latter had only two, and were at the time among the most powerful destroyers in the world with 3,400 tons at full load, 37-42 knots and five guns of 140 mm. 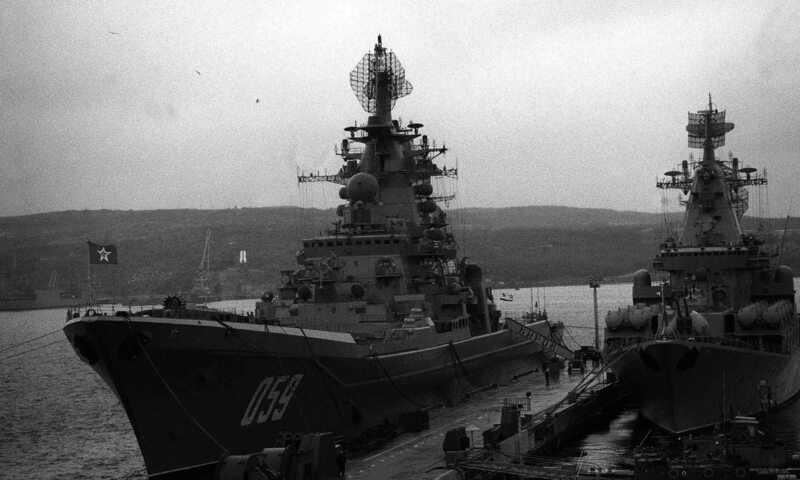 They anticipated the new generation of “super-destroyers” of the Mogador class (1936), armed with eight 140 mm double turrets. But the bulk of the fleet was provided by standard destroyers of the Bourrasque and L’Adroit classes. French super-destroyer Le Triomphant, as repainted in 1940. Total, 32 heavy destroyers and 38 standard destroyers, showing the the “leaders” first intended were as much important numerically. It was even thought each was capable to deal with two Italian destroyers, making for a clear-cut numerical superiority in this class of ships. Before the war, Le Hardi class destroyers were under construction, 12 units of which only one (Le hardi) began tests in September 1939. 8 others were completed during the conflict, only to be scuttled in Toulon in 1942. France and Italy considered this light type gradually abandoned by other fleets, as seen as it was useful in the Mediterranean, where the light construction and limited autonomy still justified their use. France retained none from 1918, but put into service those of the La Melpomène class (12 units, 1935-37), while the 12 larger Le Fier class were under construction in 1939. Six were launched and Taken over by the Italians who hoped to finish them and return them to service after their capture and transfer by the Germans. France in this field was a pioneer, setting the example with Laubeuf’s Narval, the first modern “submersible torpedo boat” (while other designs emphasised underwater performances and were often overly complex). This 1910 design became the basis of future submersibles for many nations. Under supervision of the controversial young school, “Plongeur” had been conceived as early as 1865. In 1914-18 French submersibles has been very active, with some success. By 1918, several U-boats has been obtained as war damage, and carefully studied, influencing some designs. For its own sake, in 1929, France launched the famous “Surcouf”, a submersible cruiser influenced by German and British submarine cruisers and projects of 1918. This ship was indeed equipped with two heavy cruiser cannons, 12 torpedo tubes With a comfortable supply, two 37mm AA guns and two 13.2mm double machine guns for close AA defence (impressive by 1925 standards), and featured a hangar and catapult for a reconnaissance floatplane. A showcase of French know-how, her war career was not very glorious and the Surcouf remains a standalone. France’s interwar submarine fleet was divided between oceanic units (the 31 Redoutable and 9 Requin), and coastal ones (Sirene, Ariane, Circe, Saphir, Argonaute, Diane, Orion, Minerve classes, altogether 40 units. ), all intended for the Mediterranean. The Aurore were still under construction in 1939-40. As a result, only the first, launched in July 1939, was operational in time. The others were completed during or after the war). The Rubis was a submarine minelayer that passed early one under free french control, and met successes in many missions as the Royal Navy has no equivalent, sinking 24 ships. In 1918, the French fleet had two hundred light units in service, but in 1940 only the small Aviso Quentin Roosevelt, Dubourdieu, Ailette, 11 of the Amiens class and 3 of the Marne class remained in service. Also from ww1, minesweepers of the Ardent (3), Friponne (2), Luronne, Granit and Meulière classes were also still enlisted. New constructions focused on colonial sloops of the Bougainville class (8, 1931-34-39), reduced copies of destroyers to show the flag on the four corners of the empire, two of which were never completed. Minesweeper class Elan (13, 1938-40) and Chamois (2, 1938-39) were built shortly before the conflict, at the rate of the retirements of 1917-18 ships. In fact, only four units of the Elan class were operational in June 1940, and they had various fortunes during the conflict. 8 SC “Eagle” class were light US-built wooden construction units (Elco, 1918), adding to 4 of French construction of the same period, same model, deployed in Indochina. 17 more, (CH1-CH5) were operational in June 1940, and four others under construction. France also experimented with two motor torpedo boats (MBTs), VTB8 and VTB9 in 1935, but leading to no further developments. This was quite the opposite for Italy and even Great Britain. Ironically, France took the opposite of the ideas of the young school, betting on a homogoneous battlefleet rather than a lot of small economic ships. Many had understood that the former role held by traditional torpedo boats was now taken by these nimbler and much cheaper MBTs. The fleet included the gunnery training vessel Condorcet (a venerable 1909 battleship partly rebuilt), and 5 colonial and riverine gunboats for service in China (Yang-Tsé) and Indochina (Mekong) with the two Argus, Francis Garnier, Tourane. Four seaplane refuellers (Sans Souci) were under construction, none were completed. Finally, the role of the fleet included the Castor and Pollux minesweeper, netlayer Gladiateur, submarine supply ship Jules Vernes, 8 Petrel class seaplane tankers and Amiral Mouchez fishery gunboat. This fine fleet in 1939 was conventional, coherent, and well-trained with a quasi-symbolic presence on the Atlantic at Brest (only a couple of old dreadnoughts and a few destroyers) the rest being deployed in the Mediterranean, facing to the Regia Marina. By then the Royal Italian Navy was qualitatively superior to that of 1914, and aligned to the Axis in an alliance that mirrored the Franco-British tacit arrangement for the Mediterranean, as the Kriegsmarine was far from capable to muster sufficient naval forces locally, but to smuggle out a few submarines. As was often the case in art, thes Washington’s treaty constraint had been salutary. Many recognized the value of this navy that events betrayed in the most tragic and ironic fashion. This fine instrument, which had been ready in 1939, had been saved from the budgetary misconceptions of aviation or the erroneous tactics of the Army. During the “phoney war”, the fleet was not inactive, far from it. In the Atlantic, the Marine Française patrolled against possible German raiders, although the RN assumed most of this role. In the Mediterranean, the Regia Marina was still neutral (until june 1940), but under surveillance. Patrols in the Atlantic were multiplying in order to track U-Bootes and the Pocket Battleships that has been deployed there. The French navy’s flagships took part in the hunting of the Graf Spee. During the Norwegian campaign, it escorted auxiliary cruisers loaded with troops (mainly the foreign legion) without incurring any losses. France did not have this vital need to protect its trade routes directly from the Germans. 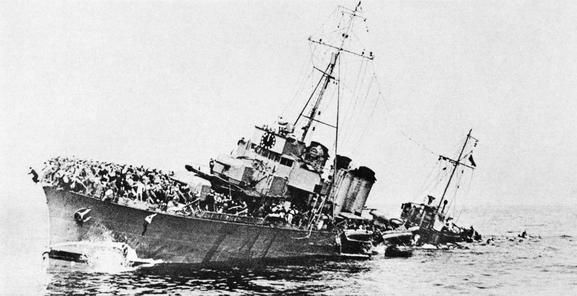 The famous photo of the French destroyer “L’adroit”, a 1500 tons, sinking in front of Dunkirk, touched by the Luftwaffe. Although the RAF was fiercely engaged during the French campaign, Churchill decided to withdraw it gradually, then totally, in anticipation of the continuation of the events. A decision that turned out to be salutary, but which resulted in the release of the sky for the Luftwaffe of Göering. But the latter, in spite of certain successes against the Royal Navy and the French navy, did not succeed in preventing the smooth operation of the dynamo operation at its end. In May 1940, the “phoney war” ended with the German invasion. If the Allied strategists are confident, reality quickly takes precedence over the many false assumptions of the French command: First, the ardennes breakthrough, the heel of the French defense, and Belgian neutrality, which delays the tactical movements of the French and British northern units. Soon, facing the formidable combined German tactics, the front crumbles from all sides. Guderian’s race to sea encloses half of the Allied forces, now retreating from the north, in a pocket centered around the old city port of Dunkirk. Here an epic naval rescue operation unfold, in which the French navy takes an active part, losing many destroyers. The Luftwaffe indeed is not hampered by a struggling and preserved RAF and an absent Armée de l’air, which leaves the field open to Stukas. The city is burnt to the ground by waves of Goering’s bombers, but the Luftwaffe fails to kill the gathering troops on the beaches, and in the matter of less than a week, most of the British Expeditionary Force and thousands of French soldiers are successfully repatriated in Great Britain. This episode, seeing French Admiral Abrial complaining about “dishonorable” decisions made by the Admiralty, was to see and the first nail into Franco-British relations hammered. Much worst was to come. In June 1940, the humiliating armistice of Rethondes is signed. As ink is drying, the fleet navy has lost so far the cruiser La tour d’Auvergne (handling accident), destroyers Jaguar, Jackal, Bison, Bourrasque, Cyclone, Sirocco, L’Adroit, Foudroyant in operations, the Maillé Brézé in March 1940 in Greenock (accidental torpedo explosion), torpedo boat Branlebas, and Rigault de Genouilly sloop. Scuttlings occured, to avoid capture: The Beautemps Beauprés (Brest), CH9, submarines Narval, Morse, Doris, Pasteur, Poncelet, Achille, Ajax, Perseus, Agosta, Sfax, Ouessant (Five by scuttling, the other lost in operations). The Jean Bart, 77% completed, escaped to the Mediterranean thanks to a true feat of seamanship. Churchill was found in a delicate situation: Having recovered most of the men engaged in the expeditionary force, the small, professional British Army had lost all its material on the beaches, roads and city of Dunkirk. The empire was left with the Royal Navy and RAF to fend off Hitler’s next move. Soon the fate of the French units, although declared neutral by the French according to the Armistice treaty, raised questions. Churchill flet the French betrayed their agreement by signing an armistice, and was soon dubious Hitler was going to respect his word about the French Navy. The prospect of seeing this intact fleet, falling into the hands of the axis gave cold shivers to the old Lion. The Royal Navy could certainly not face the combined naval forces of Germany, Italy (now in the war), bolstered by the French fleet. It was therefore there that was defined the controversial and difficult operation “Catapult” which repercussions were considerable for the fate of former comrades in arms. At the same time the RAF was mustering all its assets to face the Luftwaffe onslaught, British Admirals were left with their most difficult task ahead: Capturing wherever possible, or disable, “neutralize” French ships by force if necessary. On 2 july, British troops seized during the night a French battleship, destroyers, torpedo boats, minor units, and submersible Surcouf in Plymouth, Portsmouth and Rosyth. Frech sailors are made prisoners for the time being (most, as events will unfold, later choose to leave for France instead of joining the Free French Forces). Dakar, Senegal’s naval base was not immediately worried, but would be listed for Operation Menace. However the 3 of July, came the ultimatum of Mers el-Kebir, which ends with the shelling of a largely unprepared fleet. This was darkest part, most tragic of the whole operation. Even before, defiance was the rule as if ships that did not left France were Scuttled as ordered, Darlan did not allow departure for UK because he suspected a possibility of British capitulation thereafter, preferring to see them in various Vichy-held French Empire possessions. At Mers-el-Kebir, the stubbornness of French Admiral Gensoul, associated with the impatience of Churchill meant the ultimatum conditions were to be rejected and Admiral James Somerville of Force H, based in Gibraltar, forced to open fire after a 6-hour delay. French seaplane carrier Cdt Teste. Opposing forces comprised on the British side, the battlecruiser HMS Hood, battleships HMS Valiant and Resolution, aircraft carrier HMS Ark Royal, and many cruisers and destroyers. At anchor, their stern facing the jetty and the sea, were the French battleships Provence and Bretagne, Dunkerque and Strasbourg, seaplane tender Commandant Teste and six large destroyers. In backup, there was an airbase with bombers and recently acquired American-built Curtiss H75 (that will shot down a British Skua), plus coastal heavy guns and fortifications. 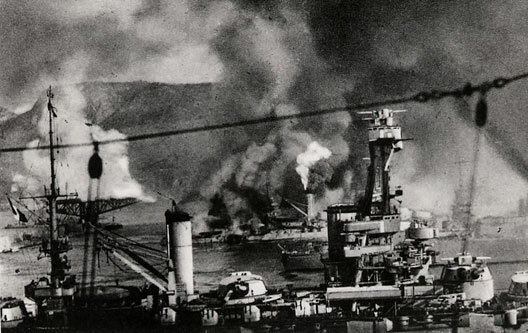 After a bombardment started at 17:54, battleship Bretagne exploded and sank with all hands, Provence, Dunkerque and the destroyer Mogador were badly damaged and run aground by their crews. Strasbourg managed to escape along with six destroyers and made it to Toulon, dodging fire, mines, and air attacks. Further raids will occur on 6 and 8 of July, the latter at Dakar against Battleship Richelieu, by planes of the Hermes, while submarine Bezeviers torpedoed HMS Resolution. Shortly after Mers-el-Kebir the French Air Force in Africa launched half-hearted bombing raids on Gibraltar in retaliation. Mers-el-Kebir: Bretagne is blewing up. At strategic level, in addition to the rupture of diplomatic relations by France, the whole operation will result in a tightening of Vichy’s positions (as will be shown by Operation Menace in Dakar and the precautions taken in Operation Torch) and prevented effectively the French Navy to join the allies until late 1942 when Darlan swapped sides. This will also led to bitter fratricidal fights at sea, like a duel on November 9, 1941, between Savorgnan de Brazza (Free French) and Vichy-held Bougainville, defending Libreville (Gabon). In Syria, this situation saw the French fighting Australians, and another British raid on Diego-Suarez, off Madagascar in the fall of 1941. Strategically, the gradual involvement of US Forces was to be first turned on a supposed much “easier” theater of operations. North Africa, which can take in a giant pincer the beaten remnants of the Afrika Korps ater El Alamein, was to be the proving ground for the then green 1st division and armoured divisions. Battleship Jean Bart at Casablanca, 1942. Despite having just one operational turret she duelled with battleship USS Massachussets. The uncomfortable position of France would continue thereafter, aggravated by the congenital suspicion of President Roosevelt against De Gaulle, and the difficult, intransigent personality of the latter. The only superior officer passed on the allied side, admiral Muselier, was going to try to set up from scratch a Free French Navy with skeletal forces, mostly because of Mers el Kebir (“…this was in our hopes, a formidable axe blow” as wrote De Gaulle). November 1942 was the great turning point: With Operation Torch (November 8-16, 1942), the Americans in their majority would face Vichy French troops, in order not to endure a vivid opposition that very likely of the British. The situation however varied depending on the sectors and personal preferences and loyalties of the officers in place. It was at the same time for De Gaulle’s Free France project, the expectation to see the “French Empire” switch side to the side of the allies, as it did. Minelayer Submarine Rubis, class Saphir. Probably the most successful French sub of the war. In spite of the little success of General Giraud to rally Vichy French authorities to the allied cause at first, the latter reversal of Admiral Darlan had a major consequence for the fleet remaining in North Africa, which de facto passed on the allied side, as well as in metropolitan France. Indeed the German reacted to the allied landings by launching Operation Lila on 27 November. They invaded the “free zone”, and race to Toulon to seize the whole French fleet. This risky operation failed, as the fleet, long prepared, effectively true to its word, scuttled totally. In merely a month, the situation of the French navy changed completely. But it was not until 1943 that these numbers were efficiently involved in the operations, in Italy and Normandy, and even in the Far East. From 2,700 men in November 1940 to more than 5,000 in August 1943, the Free French Naval Forces used a number of valuable units (see below) as well as British and American light units, not to mention technical refit in US arsenals. The Richelieu in the Far East, 1945. The camouflage is experimental. The ship had been fully re-armed two years earlier in NY. She carried the standard AA artillery of American battleships, exception of the dual-purpose turrets, French multiple 135 mm and 100 mm. The Jean Bart, completed at 77% when she fled Saint Nazaire, will be completed well after the war. As a result of operation “Torch”, French losses (ships stranded, or scuttled) will include the cruiser Primauguet, the destroyers Epervier, Milan, Typhon, Tramontane, Tornade, Brestois, Boulonnais, Fougueux, Frondeur, submersibles Ariane, Danae, Le Conquerant, L’orage, Sidi Ferruch, Argonaute, Diana, Medusa, Amphitrite, Oreade, Sybille, Psyche, Pallas, Ceres. On the other hand, in Toulon, on 27 November 1942, the Dunkerque and Strasbourg battleships, the battleship Provence, Cdt Teste, heavy cruisers Colbert, Foch, Algeria and Dupleix, light cruisers La Galissonnière, Jean de Vienne, La Marseillaise, destroyers Lynx, Chepard, Valmy, Verdun, Lion, Vauban, Eagle, Gerfaud, Vautour, Vauquelin, Cassard, Kersaint, Tartu, L’indomptable, le Volta, Mogador, La Palme, L’Adroit, casque, Lansquenet, Mamelouk, Sirocco, un torpilleur, submersibles Thetis, Vengeur, Espoir, Fresnel, Poincaré, Pascal, Achéron, Redoutable, Diamant, Venus, Mermaid, Naiade, Galatee, Pallas, Ceres, and D’Iberville sloop scuttled, and became dry losses. The Germans no longer felt bound by the conditions of armistice after the American landing in North Africa, and seized the French ships based at Bizerte, and tried to recuperate some units scuttled in Toulon. Some were to resume service under axis flags in 1944-45. These were the destroyers Tigre (FR23), Panthere (FR22), Valmy, Lion (FR24, FR21), several units of the class Le Hardi, FR32 to 37, torpedo boats (class La Melpomène) FR41, 42 and 43, submersibles Such as the former Requin class (FR111-114), the FR117 (ex-Circe), FR112 and 116 (ex-Saphir and Turquoise) were thus expected to reinforce the naval forces of the Kriegsmarine in the Mediterranean or the Regia Marina. But even in that case many French workers sabotaged this process at any level, considerably slowing it down, until these ships were operational. French cruiser Gloire, as repainted with its distinctive dazzle camouflage and rearmed in an US arsenal, 1943. 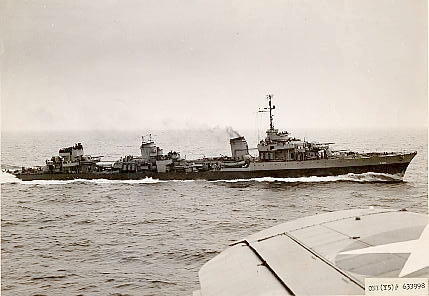 The strength of the FNFL (Forces Navales Françaises Libres) had increased significantly since January 1943: Battleship Richelieu, which joined NyD (New York) from Dakar, light cruisers Montcalm, Georges Leygues, Gloire, Emile Bertin, old battleships Courbet, Paris and Lorraine, soon Relegated to secondary roles, aircraft carrier Béarn (used as aircraft transport), heavy cruisers Duquesne, Tourville, Suffren, light cruisers Duguay Trouin, Jeanne d’Arc, upgraded to the standards of the US Navy, destroyers Leopard, Albatros, Le triomphant, Le Fantasque, Le Malin, Tempête, Mistral, Trombe, L’Alcyon, Le Fortuné, Forbin, Basque, Torpedo boats Melpomène, submarines Marsouin, Archimède, Argo, Protée, Pégase, Le Glorieux, Le Centaure, Casabianca, Rubis, Perle, Antiope, Amazone, Orphée, Junon, Minerve; Or the Savorgnan de Brazza sloop, 9 Elan class minesweepers, and 4 Chamois, representing about half the naval strength of the French Navy in 1940. In addition, the Allies supplied 15 Minesweepers, torpedo boats of the Fairmile A and Fairmile B models (17 units), 32 other ASW boats, 5 Elco type torpedo boats, and between March and November 1944, 32 US sub-chasers of the “PC” type, And 52 of the “SC” type, most operating in the Mediterranean.